Five years ago, the New York experimental theater group Elevator Repair Service staged an audacious workshop production of F. Scott Fitzgerald’s classic novel “The Great Gatsby.’’ Not a word of the original text was excised. Every descriptive passage, every evocative detail, every “he said’’ and “she thought’’ was uttered verbatim. The piece, called “Gatz,’’ ran an epic 6 1/2 hours. In the show, a man in a dreary, dilapidated office begins reading a paperback version of “Gatsby’’ aloud and doesn’t stop until the lives of Daisy and Tom Buchanan, Jay Gatsby, and Nick Carraway reach their tragic culmination. The unpublicized workshop became an underground phenomenon, attracting industry luminaries to the Wooster Group’s Performing Garage in SoHo. But before Elevator Repair Service could capitalize on its blazing-hot word of mouth to stage a full-scale production, the Fitz gerald estate put a stop to the workshop and told the company it could not perform the show in New York. The estate was concerned about the impact of “Gatz’’ on a more traditional stage adaptation of the novel that was aiming for Broadway. Since then, “Gatz’’ has become something of a cult legend, with an aura that oddly echoes the mythology surrounding the enigmatic millionaire at the center of “The Great Gatsby.’’ Elevator Repair Service has mounted the show around the world, including Brussels, Amsterdam, Dublin, Minneapolis, Philadelphia, and Chicago. But it’s mostly been seen in short, weeklong engagements, for a total of only about 50 performances. 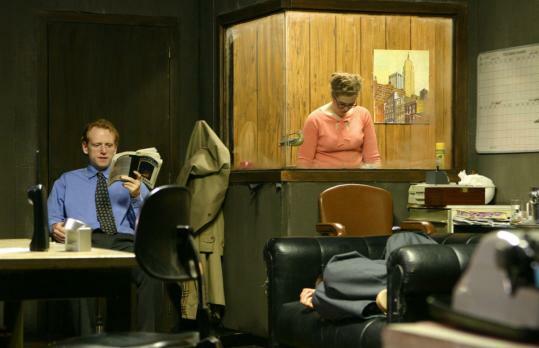 Set inside a shabby, rundown small business, complete with desks, file cabinets, and old computers, “Gatz’’ begins when an office worker finds an old copy of “Gatsby’’ and starts reading it aloud. Soon the book exerts a strange force on his fellow employees: Small coincidences crop up, as incidents in the novel mirror action in the office. Before long, workers start inhabiting the characters from the novel’s glittering world, and everyday objects become props in the story. A desk chair serves as Gatsby’s roadster. Liquor bottles materialize from file cabinets during a wild party scene. Yet every so often, the reality of office life reasserts itself. Someone turns on an overhead fluorescent light or delivers a stack of papers. The staging echoes the theme of the book, according to Elevator Repair Service. With Fitzgerald’s novel, “we realized that it presented us with this huge problem of being a novel, but not being the right kind of writing for the stage,’’ says Collins, 40. “And that’s when we hit on this idea of: Well, let’s just not edit it. What happens if you just put a novel onstage exactly as it is? What kind of theater can you make around that? Maverick comedian Andy Kaufman used to read “The Great Gatsby’’ aloud in his stand-up days, perhaps tweaking audiences who longed to see him perform as Latka, his famed TV character on “Taxi.’’ Kaufman would go on and on, and when viewers would finally revolt by heckling, throwing dinner rolls, or walking out, he might break down and cry - or offer to play a record instead, then cue up a disc of him reading “Gatsby’’ exactly where he had left off. Elevator Repair Service knew all about Kaufman’s stunt. After all, the company had done an entire production about the comedian’s strange career. But once it took on the project, the company found that what was most affecting about the novel was the writing itself - the evocative nature of the language, the poetic rhythms of the sentences. An idiosyncratic, free-form, and collaborative approach to creating work has defined the company since Collins and friends founded it in 1991. Now revered in downtown theater circles, Elevator Repair Service has been influenced by the visionary New York director Richard Foreman and the Wooster Group, both of whom Collins works with as a sound designer. “Gatz’’ is perhaps the company’s most famous work to date (it’s also the biggest, with a cast of 13). Other unorthodox, mischievous mind-benders include a piece inspired by Euripides’s “The Bacchae,’’ featuring a metal thermos with googly eyeballs as a stand-in for Dionysus (“Highway to Tomorrow’’); a re-creation of bygone television interviews with Beat legend Jack Kerouac using the actual transcripts (“No Great Society’’); and an attempted reconstruction of Salvador Dalí’s long-lost, never-produced screenplay for the Marx Brothers (“Marx Brothers on Horseback Salad’’). The company’s acclaimed off-Broadway debut in 2008 was “The Sound and the Fury (April Seventh, 1928)’’ - a version of the first section from William Faulkner’s masterpiece. Elevator Repair Service eschews mission statements, mantras, and even employing certain theater-making methods from one show to the next. “As soon as I begin to recognize and name anything that we’re doing, that becomes a thing to not do anymore,’’ says Collins. To maintain a fresh approach, says Collins, the troupe members keep trying to invent new and different experiments for themselves. For the audience, “Gatz’’ is a chance to rediscover a classic that most people probably haven’t picked up since high school. And what they find might just astonish them. It’s the same kind of patience that will be required for theatergoers tackling all 7 1/2 hours of the “Gatz’’ marathon - and who could be rewarded with a transformative theatrical experience.